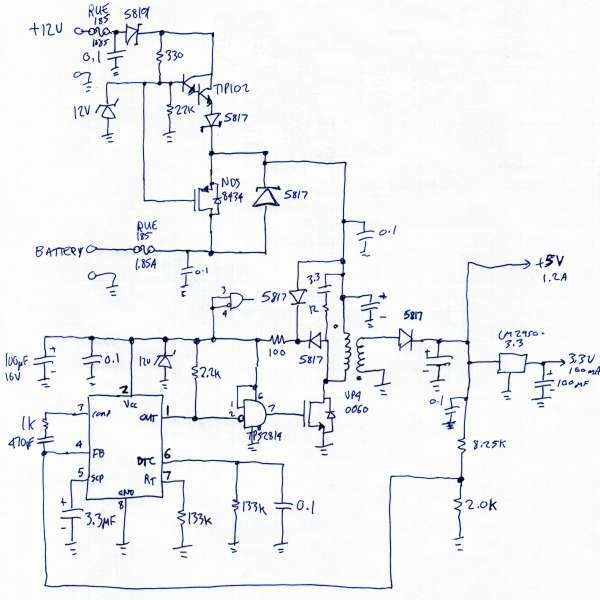 Len Averyt sent this Power Supply Schematic GIF File Generated From AutoCAD. Figure 4: Someday this hand-drawn power supply schematic should be replaced with a nice and neat image. Figure 4: The two unspecified polarized capacitors (one directly above the transformer and one directly to the right of the transformer) are actually each a pair of 470 µF capacitors in parallel (for a total of four 470 µF capacitors). These capacitors MUST be Low-ESR types for the power supply to function properly. Figure 4: The two 100 µF 16V capacitors were changed to 33 µF. PJRC provides these as Low-ESR capacitors to reduce noise. Standard capacitors, from 22 µF to 220 µF are likely to work. Figure 4: The capacitor labeled "3.3" (above and to the left of the transformer) is 3.3 nF, or 0.0033 µF. Figure 4: The IC is a TL5001 PWM Controller. The AND gates are TPS2814 MOSFET drivers. Figure 4: The 3.3 µF capacitors attached to pin 5 should be 2.2 µF (either value will work, but we have been using 2.2 µF on the assembled boards and unassembled kits). This capacitor sets the time constant before the power supply will automatically shut off when the output is shorted or the input voltage is too low. Figure 4: The diodes shown connected between the source and drain on the two MOSFET transistors are the diode structures inside transistors. These two diode symbols do not represent actual diode components soldered to the circuit board. Figure 3: The upper chip is 74HC165, and the lower one is MAX232. MP3 Player, Schematic For Rev C Board, Paul Stoffregen.